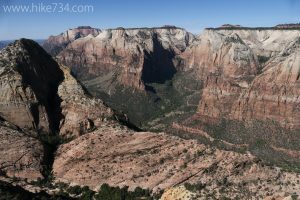 This one-way, epic day along the length of Zion’s East Rim hits all three summits that have a trail leading to them (Deertrap Mountain, Cable Mountain, and Observation Point). The views from the stops along the way, while similar, each have their unique perspective on Zion Canyon. A shuttle is needed to get you to the East Rim trailhead near the East Entrance and the Zion bus system can be taken back to your car at the Zion Visitor Center. The wide trail continues to climb up onto the plateau. The contrast between the sandstone with desert brush and the ponderosa pine forest is fantastic as you move from valley floor to high perches. Views of the surrounding mountains are impressive and constantly changing. Eventually you reach the edge of the canyon wall and the views go from interesting to incredible. Right where the trail first comes to the edge of the cliff, you can look directly down onto Zion Lodge. 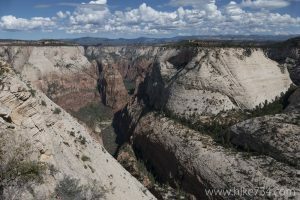 Across the canyon are views of the Sand Bench Trail and the Emerald Pools. Peaks along the canyon rims are visible everywhere. Mountain of the Sun dominates your view at eye level, as well as the prominent rock features known as the Court of the Patriarchs. Follow the trail back to the junction with the Cable Mountain Trail and take the fork heading left to Cable Mountain. After a little more elevation gain, the trail drops. The trail ends at the cable structure and the precipitous rock edge of the canyon wall. Views are nothing short of breathtaking as you look across the valley and far to the north. 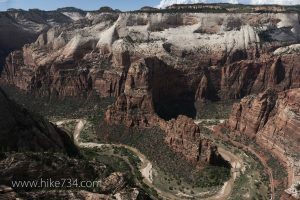 Angels Landing rises prominently in front of you and the Zion Canyon road follows the Virgin River that snakes thousands of feet below you. Head all the way back to the junction near Stave Spring and follow the East Rim Trail north towards Echo Canyon. You cross through a broad sagebrush meadow and to the steep cliff edge of one of the side canyons that leads down to Echo Canyon. (Note that the trail that comes in from the east in this sagebrush meadow is the trail from the Zion Ponderosa Ranch.) The trail follows along the steep, impressive walls leading to switchbacks down one of the faces to the bottom. As you reach the bottom, trees impossibly spring up out of the slickrock. The trail dissolves on the hard sandstone surface. Pay attention to cairns, stacks of rocks, to guide you along the “trail”. After about a mile, traverse along the bottom of the canyon, the signed trail for Observation Point takes off to the right. This section of trail, hewn from the rock, is a marvel of trail engineering. 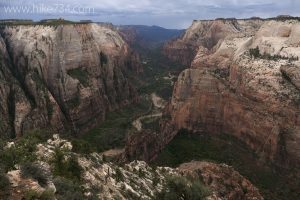 The switchbacks, visible from the bottom of Zion Canyon, take you steadily to the top of the rim. The views from this section of trail that hug the cliffs are nothing short of breathtaking and are not for those with a fear of heights. Back at the junction for the Observation Point Trail, take a right to head through the heart of Echo Canyon. The canyon narrows down and the walls almost completely close in overhead creating a tunnel of sorts. This section is a worthy destination in and of itself. This area can also become very dangerous in the event of flash flooding, so proper attention to the weather is paramount. After the narrow part of the canyon, it opens up into a large area with high walls that makes it feel like you’re in a large room. The trail emerges from the narrow canyon and into a bend along the Virgin River in the main Zion Canyon that includes the Weeping Rock Trail. The paved trail switchbacks down to the Weeping Rock trailhead. 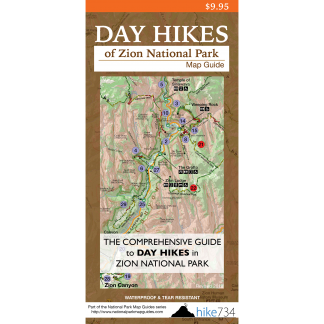 Trailhead: From Springdale, take Highway 9 east through the Zion-Mount Carmel Highway Tunnel. Make a left at the turnoff on the north side of the road just before the East Entrance. The trail starts at the gate at the end of the parking lot. Arrangements can be made in advance with one of the shuttle services in Springdale to take you to the trailhead. The trail ends at the Weeping Rock trailhead, allowing you to use the Park’s free shuttle back into Springdale.